New video screen technology by a local event company has wedding guests getting artsy. A favorite on the wedding circuit, Level11 Events is known for their unique fusion of live music and DJ-spun tunes, giving guests the best of both worlds. 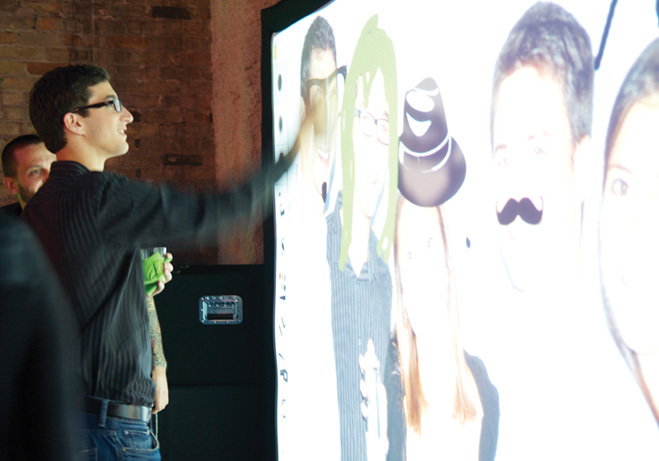 Expanding on their high-tech entertainment arsenal, the company recently introduced an exclusive technology sure to wow reception guests: a virtual graffiti wall. The 10-by-6-foot interactive video screen, which acts as a canvas and comes with virtual spray cans and markers, can be used in lieu of a guest book (think life-size photo of the bride and groom for guests to sign) or as an entertainment attraction during the reception. On-hand staff will snap photos of friends and family and post them on the screen so guests can get creative with colorful spray cans and pens, backgrounds and stencils (think sunglasses and a mohawk). Guests get a 4-by-6-inch print so they can keep their artwork, and all images are available for free download after the event. Couples and guests walk away with photos to remember the night, but it’s likely they’ll never forget the fun they had getting their graffiti on. “You only get one chance to make that memory, and we spend significant time and resources to ensure that we make fantastic memories,” says Level11 president David Baer. Two trained staff members accompany every reservation of the virtual graffiti wall, and delivery and setup before guests arrive are included. Looking for an even higher level of artistic infusion in your reception? They have graffiti artists available to entertain onlookers with their street-style painting skills throughout the night. Instant Request’s custom booths kick up DJ décor.